attributed to Thomas McIlworth (ca. 1720–ca. 1769), ca. 1758–ca. 1760. John and Judith Herdeg collection. Thomas McIlworth was a Scottish painter who arrived in New York around 1757. He first advertised as a portrait painter the following year, in the New York Mercury. 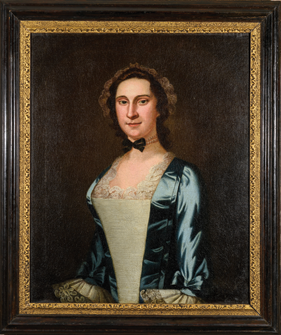 This portrait was painted between that time and early 1760. He also painted portraits of Thompson’s brother-in-law William Walton and other prominent New Yorkers, including members of the Morris, Beekman, Stuyvesant, and Van Cortland families. 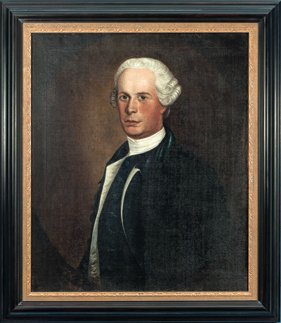 In 1762 he moved to Albany, where he painted portraits of the Van Rensselaers, the Livingstons, and others. In 1767 he was in Montreal and is believed to have died in 1769. Opportunity. That was what brought James Thompson to New York in 1748 at age twenty. He came from the linen-manufacturing town of Newry in Northern Ireland.1 Some of the best seed for growing flax, from which linen was made, came from New York, so there was active trade between the two communities. It was not surprising, then, that Thompson gravitated to the merchant community in his new land, establishing his own shipping business between New York and his home country. Catharine’s father, Jacob, and her uncle, William, carried on the family shipping business they had inherited. When Catharine’s father died in 1749 William continued to grow the business, and in 1752, he built the Walton mansion on Pearl Street. One of the city’s great houses, it was a three-story, Georgian-style residence with “a majestic front door framed with fluted classical columns and topped by a broken pediment with the Walton coat of arms,” and the interior was decorated with marble floors and crystal chandeliers.4 This was the family into which James Thompson married. They were wealthy, socially prominent and well-connected. By 1754, a year after Thompson’s marriage, the flaxseed trade with Ireland had become the city’s most important activity. But trade with the Caribbean had also begun to flourish. The islands needed lumber, grains, salted provisions, manufactured goods, and general supplies. In turn, the North needed the islands’ sugar, molasses, indigo, coffee, and cotton. Trading between the islands and the North soon eclipsed the Irish trade, but became complicated by tensions between England and France over control of the New World. When England’s King George II declared war on the French in 1756, trading with the French islands was forbidden. The political repercussions were a problem for the northern merchants since most of the sugar came from French plantations on the islands. The solution laid in the island of Hispaniola, which belonged to both France and Spain—a neutral country—and allowed for the two countries to trade freely between themselves. As might be expected, northern merchants took advantage of this situation. They sent their ships to Monte Cristi in the Spanish part of the island, where their cargos were put onto Spanish ships and taken a few miles around the point to Saint-Domingue in the French part. Once the cargo was off-loaded, the ships retraced their path filled with French goods and delivered them to the waiting northern ships still anchored in Monte Cristi. Not surprisingly, Monte Cristi became one of the busiest ports in the Western Hemisphere. Thompson was an active participant in this trade. As the conflict between England and France grew and prisoners of war were taken by both sides, exchanging prisoners provided another opportunity for financial gain. “Flags of Truce” ships were licensed to exchange prisoners and were allowed to also carry cargo for trade. Thompson seized the opportunity and this permitted him to trade directly with the French in their part of the island. Seeing how this trade was providing sustenance to the enemy, in 1759 the British Navy began to prohibit flag-trucers and Thompson was caught in the crackdown. On June 9, 1760, his brig Achilles, flying the distinctive white flag, departed from French Saint-Domingue for the North. The next day it was captured by British war ships and taken to Jamaica, where both it and its cargo were confiscated. Insolvent as a result and unable to pay his creditors, Thomson was confined to debtors prison in New York in the spring of 1761, owing more than £10,500, a very large sum at the time.5 Interestingly, more than a third of that was owed to his wife’s family. Another significant creditor was Andrew Thompson, his brother in Northern Ireland. Examination of his inventory divulges how successful the young immigrant had been.7 His household was furnished extensively with mahogany—the wood of preference for those who could afford it, and included “a mahogany secretary, 2 mahogany tea stands, 8 mahogany tables, a mahogany dressing table, 18 mahogany chairs, a mahogany [looking] glass, 8 walnut chairs with silk bottoms, bedstead and bed hangings, and numerous other pieces of furniture. It also reflected choice furnishings from around the world, including 300 pieces of Chinese export, a case containing silver mount knives, forks and spoons, 3 gilt sconces, 2 gilt branches (sconces), 4 gilt landskips, 13 Italian prints, 6 India prints, 2 turkey carpets, 2 green silk and worsted window curtains, and 3 window curtains of crimson damask. There were also twelve family pictures, presumably including those of James and Catharine appearing in this article (Figs. 1, 2). Clearly, Thompson and his family had been living in a world of great luxury. attributed to John Wollaston (ca. 1710–1775), ca. 1749–1852. Ex-collection of Bayou Bend; presently in a private collection. Image ©2013 Don Netzer Photography. John Wollaston was a London-trained painter who arrived in New York in 1749. An accomplished portraitist, with exceptional ability to paint fabrics, he produced portraits of many of the most distinguished people in the city during the three years he was there. Little did Thompson know that New York’s Lieutenant Governor Cadwallader Colden had announced a crackdown on all trading with the French, even through ports of “any neutral prince or state.” The British Navy was put on heightened alert and patrolled the waters off Montauk Point. Ships were seized, as were French agents working in New York. Thompson’s sloop, though, slipped through. Presumably Thompson continued to prosper. He and his wife removed to Ireland in 1770, where he engaged in the Irish immigrant trade. When the British forces occupied New York in 1776, he returned and supplied provisions for the troops. With the defeat of the British in 1783, his New York property was confiscated and he left for England, where he sought compensation for his losses, though it is unknown whether or not he succeeded. What is known, though, is that he returned to New York, and on the evening of January 12, 1786, his daughter, Ann, considered one of the most beautiful women in the United States, married Elbridge Gerry, a successful merchant from Marblehead, Massachusetts, also a Founding Father, a member of the Continental Congress, a Signer of the Declaration of Independence and the Articles of Confederation, and later elected vice president of the United States. Thompson died in New York in1812, having survived his wife, Catharine, who had died in 1807. Ann and Elbridge Gerry went on to have ten children, nine of whom survived. Elbridge, Vice President under James Madison, died in a carriage while crossing the District of Columbia en route to his office on November 23, 1814. Anne died in New Haven in 1849. Thompson’s daughter Catharine, another of Thompson’s daughters, married Isaac Coles, who became a Senator from Virginia in 1789. Little is known of Thompson’s other five children, only one of whom married but did not have children. 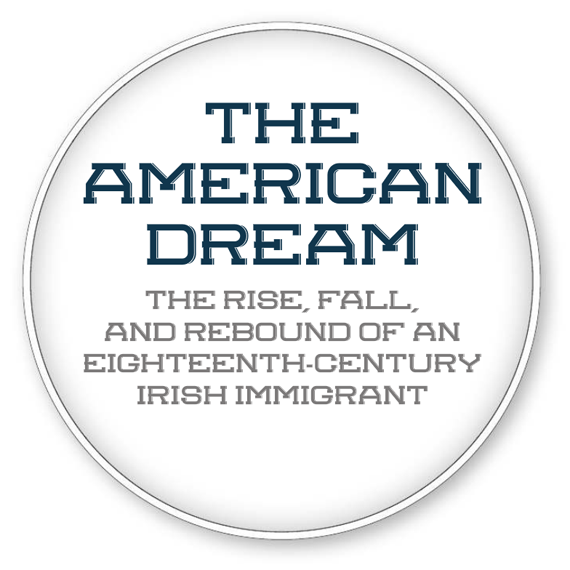 James Thompson, the young immigrant from Ireland, had come to find success in the New World. Financially, he made one fortune, lost it, rebounded and made another, being described more than a century later, on March 17, 1913, in the Boston Evening Transcript, as having been “a rich merchant of New York.” Personally, he wed the daughter of one of New York’s leading families and then married off his daughter to a future vice president of the United States. John A Herdeg is a collector and scholar. He and his wife, Judy, collect American eighteenth-century portraits. Their research on the sitters of these two portraits led to this article. 1. For more about Thompson and the colonial shipping trade, see Thomas M. Truxes, Defying Empire: Trading with the Enemy in Colonial New York (New Haven: Yale University Press, 2008) and Irish American Trade 1660–1783 (Cambridge: Cambridge University Press, 1988). 2. For more about the Walton and Beekman families, see Annette Townsend, The Walton Family of New York 1630–1940 (Philadelphia: The Historical Publication Society, 1945) and William Benford Aitken, Distinguished Families in America Descended from Wilhelmus Beekman and Jan Thomasse Van Dyke (New York: The Knickerbocker Press, 1912). 4. Edwin G. Burrows and Mike Wallace, Gotham: A History of New York City to 1898 (New York: Oxford University Press, 1999), 177. 5. New York Co., N.Y. Deeds, 35: 498–504. 8. For this and all following quotes, see Truxes, Defying Empire.